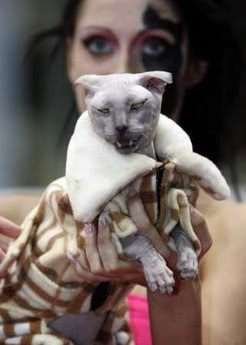 The Eight Annual International Cats Exhibition was held in Moscow this December, and this Sphynx cat was one of the many participants. Is it wearing makeup? How much can we do to this cat? We've bred away its hair, curled its ears, wrapped it in a coat, and painted it. You've come a long way from your ancient, forest-dwelling ancestors, Mr. Sphynx. You now live in the lap of luxury, and that trajectory is something that most humans aspire to. But I'm not sure that's what you would have wished for. Poor Kitty. Somewhere now Madonna is weeping over the resemblance. I dunno, is that cat really farther from its ancestry than this vicious killer dog? "How much can we do to this cat?" That poor cat looks like a gargoyle. Animals are not TOYS! They're animals.